JUKI sergers are favorites within many sewing circles and they always get rave reviews. The first JUKI sergers were designed from industrial sergers, so it should come as no surprise that modern JUKI sergers are still among the best available - and now for home usage too. Reliable, affordable and easy to adjust, JUKI's aim is now to make high quality machines suitable for any household. 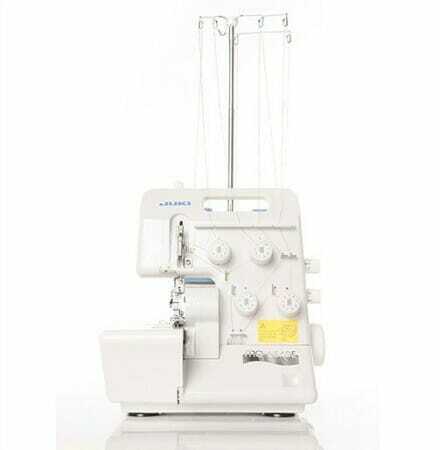 This standard model far exceeds the expectations of other sergers of a similar price range. Just take a look at all the positive (and not so positive) things reviewers had to say about the JUKI portable serger to make an informed decision for yourself on whether this is the right serger for you. If your serger isn’t easy to thread, it isn’t going to be popular with reviewers. JUKI has overcome the threading difficulty by including a color coded guide to help users keep track of where each thread is going. As if that wasn’t enough to help you with the threading, JUKI has also implemented a special lever to assist with threading the lower looper. Infamous for being the hardest part to thread, the lower looper can now be threaded more easily by pushing a lever which slides the lower looper to the right. You can hear all the sighs of relief from the many reviewers who now don’t have to fetch a pair of glasses or squint into the serger to see if it has been threaded correctly. Regular maintenance of your serger will keep it healthy and extend its lifespan. This maintenance requires cleaning your serger. Positive reviews about the ease with which you can clean your JUKI serger are overwhelming. The front and side covers of the serger can be opened. This allows you to clean the insides with a lint brush. This can be compared to many other sergers which will require you to take the serger apart with a screwdriver before you can clean out the insides. No thank you. Don’t forget the close these covers though because JUKI has included a safety feature which stops your serger from working if the covers haven’t been closed properly. Other reviewers have taken their laziness (or should we call it cleanliness?) to the next level by cleaning the insides with compressed air. Unlike most other sergers, the motor of the JUKI portable serger is concealed. This allows you to clean the insides with compressed air without worrying about blowing lint into the motor. If you frequently suffer from headaches or you just don’t like loud sergers, then the JUKI portable serger will solve your problems. It is well known in the sewing community that sergers are a lot louder than sewing machines. The relative quietness of the JUKI serger is a blessing to all the reviewers, some of whom are mothers with babies trying to sleep in the next room. The bottom of the serger even contains suction cups. This gives the serger a better grip on the table and stops it from rattling around, decreasing the amount of noise that it produces. Switching between different types of serger stitches no longer has to be a chore. The rolled hem is a built-in feature of the JUKI serger and it’s quite easy to switch to rolled hem mode. All you need to do is remove a needle and move the small lever to the front. Despite the variety of stitches that the JUKI portable serger can produce, the instruction booklet doesn’t tell you how to make all these stitches. This has caused quite a disappointment to users of the JUKI serger. This problem can be easily fixed by purchasing a serger book or looking up the instructions online. It’s not such a big deal, but many users would have appreciated that everything came in one bundle rather than discovering these missing instructions once the serger has arrived. 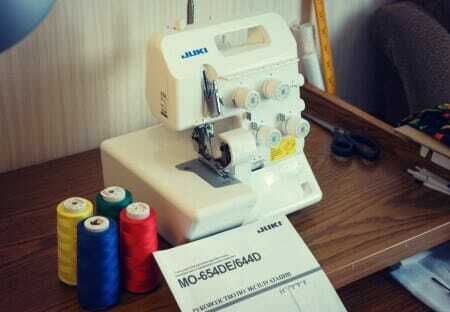 Let’s not forget to add that even though the JUKI is capable of making a wide variety of stitches with its 3/4 thread capability, it is also unable to do a coverstitch, so you’ll need to purchase a separate machine if you require this particular serger stitch. Another little grumble some reviewers have about the JUKI serger is the lack of a bin for collecting fabric scraps. Considering that all sergers contain a blade for trimming off excess fabric while you’re sewing, you would think that JUKI would include a waste collector for these pieces. Again, it’s not such a big problem, you’ll just have to spend a bit of time sweeping and vacuuming the floor after you’ve finished working. Currently priced at around $350, the JUKI portable serger sewing machine is easy to use and most of all quiet, a very unusual feature for a serger. This quietness can be beneficial if you plan on serging late at night or if you have a baby who needs to sleep during the day. For $350, the JUKI serger contains all the features of a standard serger, including adjustable stitch length and differential feed, plus the added bonus of easy cleaning. It’s a good price for the high quality of industrial serger components being used in a simple household serger. You can be confident that your machine will run without any hiccups. The JUKI portable serger excels at being one of the most convenient sergers available on the market (aside from the issue of the missing waste collector). 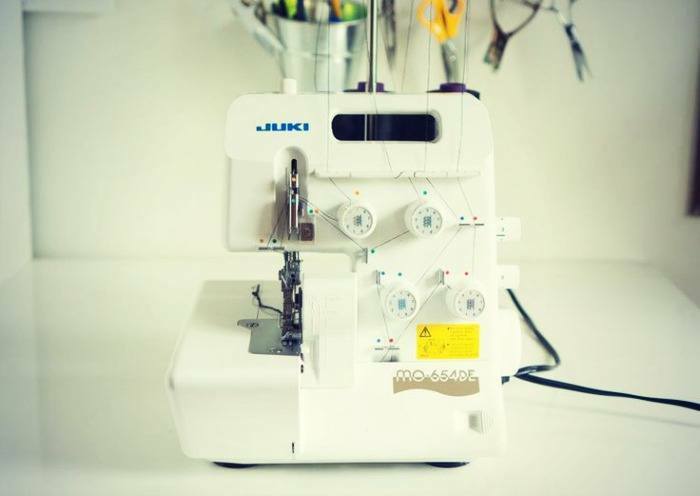 Many reviewers have fallen in love with this JUKI serger and it’s not hard to see why. Its quietness gives you the ability to serge at any time, so even if you’re busy during the day there’s now no excuse preventing you from making those professional looking sewing products by night. Made from components used in industrial sergers, with the proper care and maintenance, this serger will serve you faithfully for many years.